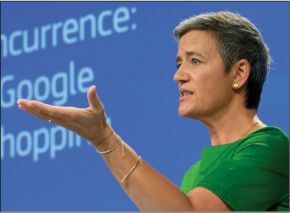 Google was slapped with a $2.7 billion fine by the European Union this week, for abusing its dominance in online search, said Michael Birnbaum and Brian Fung in The Washington Post. Antitrust re gulators in Brussels say Google “illegally steered users” toward its own comparisonshopping site over those of its rivals, and ordered the company to open up its shopping search results to competitors. Google now has 90 days to comply or face steep penalties of up to 5 percent of the daily revenue of its parent company Alphabet, fines that could be backdated years. This record-breaking fine “could be just the start of Google’s headache in Europe,” said Rob Price in Business Insider.com. The company is still facing EU antitrust investigations into its Android mobile operating system and AdSense advertising business, “far more fundamental parts of Google’s business than its shopping service.” Google can probably afford to shoulder additional multibillion-dollar fines, but more negative rulings could upend how the company operates on the Continent. The search giant may also face lawsuits from rival comparison sites that say they’ve been harmed by Google’s business practices. “American dr ivers are preparing to hit the road this Fourth of July,” said Hailey Waller in Bloomberg.com. The American Automobile Association expects a record-breaking 44.2 million Americans to travel at least 50 miles away from home over the holiday weekend, encouraged by the lowest seasonal gasoline prices in 12 years. U.S. drivers will pay an average of $2.21 a gallon, the first time in 17 years that gas prices are expected to be lower on July 4 than New Year’s Day. Domestic airfares are also 10 percent lower this year, leading to an uptick in holiday fliers. “The company at the heart of one of the worst auto safety scandals in history has filed for bankruptcy,” said Jethro Mullen in CNN.com. Takata, whose exploding airbags were linked to 11 deaths in the U.S. and triggered a massive recall, announced this week that it’s seeking bankruptcy protection. The Japanese company, which has $9 billion in debt, is also “selling the lion’s share of its business” to a rival. Key Safety Systems, which is Chinese-owned but based in Michigan, is paying $1.6 billion for most of Takata’s operations, minus its airbag inflators.